The empty lawn and beach waiting for summer. 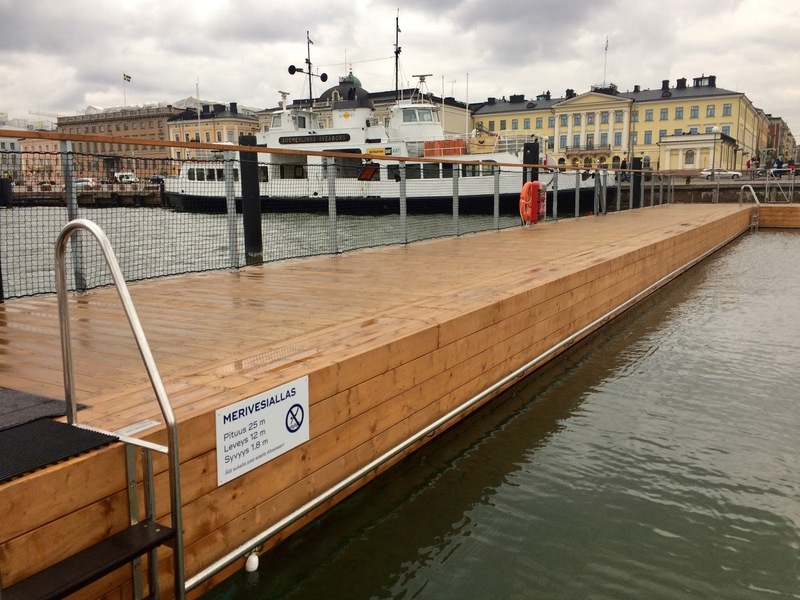 Allas Sea Pool is a new opportunity to experience an outdoor swim in downtown Helsinki. To kick off November I headed for this new cool city beach. 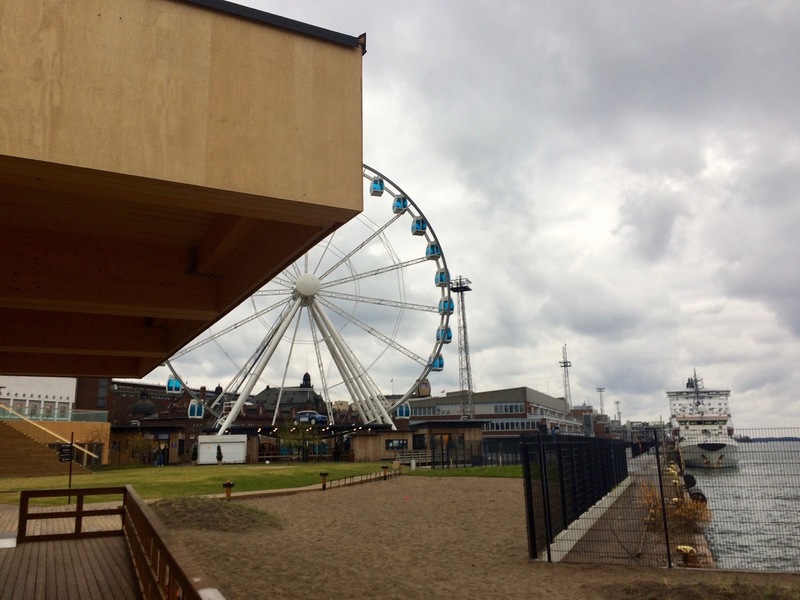 It's easy to find by the seaside marketplace near the ferris wheel. 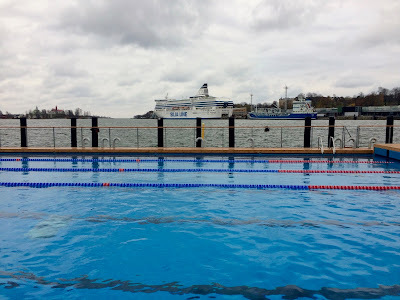 The seawater pool with Suomenlinna ferry in the background. I paid the 9€ entrance fee and changed into my swim gear in the dressing room. After taking the obligatory shower I dashed out to the nice wooden swim area with three pools: a cold 25m sea water pool, a warm 25m pool and a smaller pool for kids. The water in the pools is clean and safe to swim. The water in the sea pool is as cold as in the harbour, only cleaner of course. The air temperature was just above the freezing point and the sea wind with drizzling rain bit into my wet skin like a vampire on Halloween. No wonder the sandy beach and green lawn were empty. I literally got cold feet already. Without further ado I jumped in the warm pool. 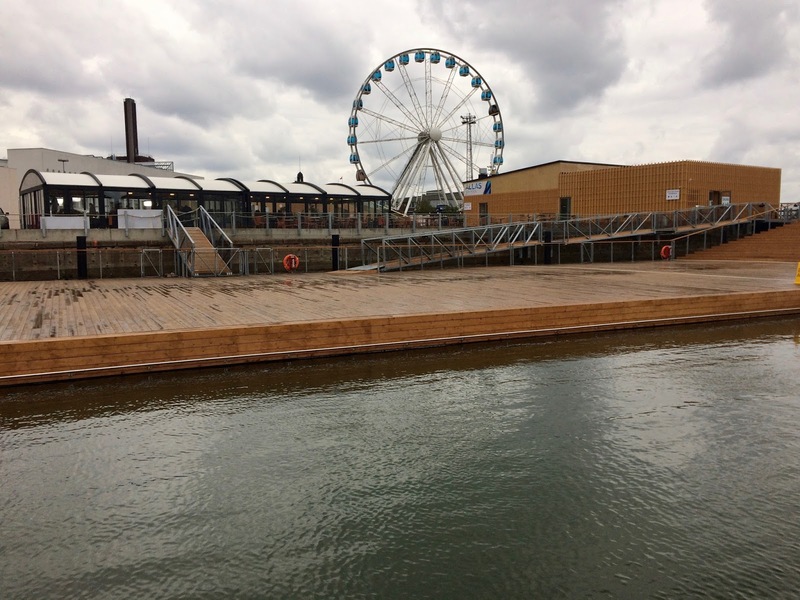 You can see the glass cafe on the left and the wooden dressing rooms and saunas on the right. 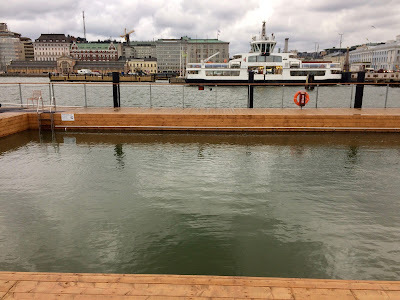 The water was pleasant 27°C. 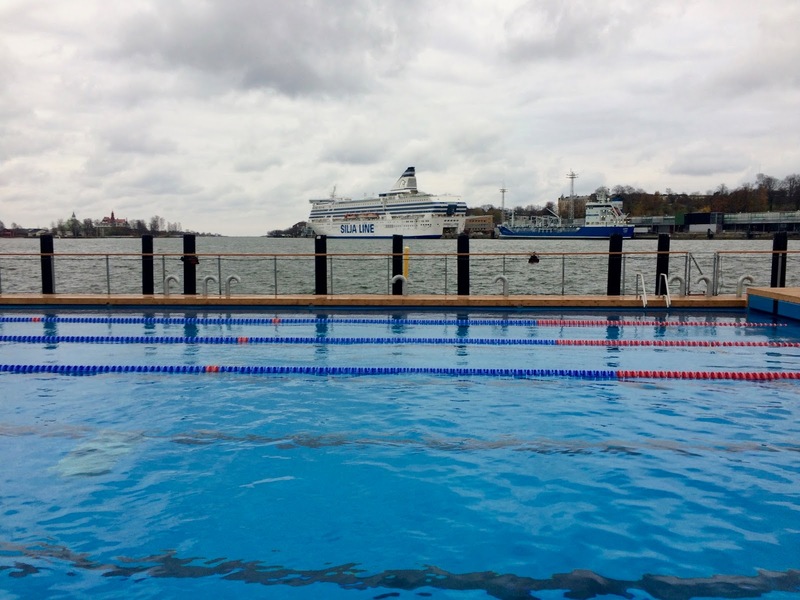 I enjoyed a relaxed 1500m watching the cruise ships and Suomenlinna ferry in the harbour. I shared the fast lane with another swimmer. There were only two lanes. I bet it will get crowded in sunny weather next summer. 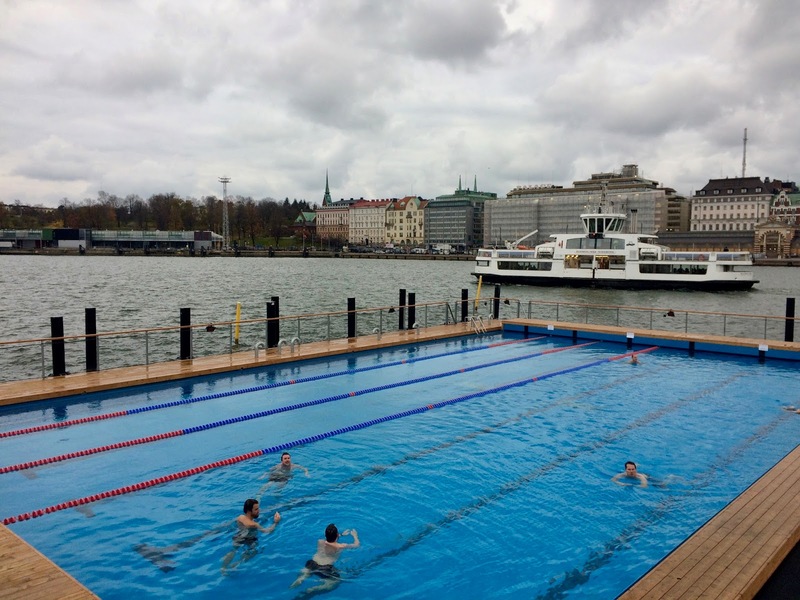 The warm pool has two lanes for swimmers. Silja Line cruise ship in the background. I finished with a dip in the refreshing 5°C sea water pool. After that I defrosted myself in the sauna. They have separate saunas for men, women and private groups. I felt pretty good afterwards in the cafe. I'll probably visit Allas again in the future.